Pillsbury Gluten Free Muffins, what you’ve been looking for! Gluten-Free Living > Blog > Food > SPONSORED: Pillsbury Gluten Free Muffins, what you’ve been looking for! SPONSORED: Pillsbury Gluten Free Muffins, what you’ve been looking for! If you are gluten free and have been searching for a moist home-style muffin bursting with flavor, our Pillsbury Gluten-Free Muffins are exactly what you’ve been looking for! These ready-to-eat muffins are individually wrapped for on-the-go convenience and certified gluten free by the Gluten-Free Certification Organization. Sold in packages of four and available in Blueberry or Chocolate Chip, they can be found in grocers’ all-natural freezer cases. Cut or break 6 muffins into chunks and spread evenly in the bottom of a trifle bowl (or any clear glass bowl with round side and a flat bottom). Spread half of whipped topping (8 ounces) on top of muffins. Layer on a little more than half of the blueberries. Repeat steps 1 through 3. 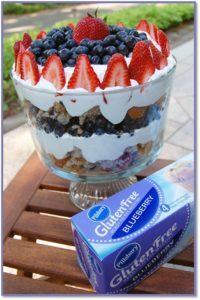 For the final layer, form an outer ring of sliced strawberries (save one whole strawberry to decorate the top) and place all the remaining blueberries in the center (see photo). Cover and refrigerate for several hours, or overnight, before serving. To find more tasty recipes like this, visit our website at www.unclewallys.com and click on our Product Recipe page. ©General Mills. Pillsbury is a trademark of General Mills, used under license. For more information, contact us at www.unclewallys.com.